The 4-hour walking tour led by Madurai Inhabitants is an excellent way of exploring and immersing yourself in the city. The company's guides are very knowledgeable and they offer a range of customizable tours. Storytrails also conducts a recommended 3-hour Once upon a Madurai walking tour that brings the city and its heritage to life. The Meenakshi Temple, a must-see south Indian temple, is the focal point of Madurai. Apparently, the city was built around the Shiva lingam that's inside its sanctum. The temple complex covers 15 acres, and has 4,500 pillars and 12 towers. You could easily spend days in there, as it's a "living temple" with a lot going on inside, including a constant stream of couples waiting to be married in its corridors. It's worth going to the temple once in the morning and again in the evening for the night ceremony. Here's what you need to know to plan your visits. Venture inside the cavernous Puthu Mandapam, a 17th century pillared entrance hall opposite the Meenakshi Temple's east tower, to find rows of tailors and stalls selling fabric, scarves, jewellery, fashion accessories, handicrafts, and art work. You can get good quality clothes made there, including decent replicas. Balbina Boutique, at shop 119, is popular with foreign customers. The lovely lady who runs it speaks excellent English. I bought a couple of stunning Madhubani paintings from her. Situated around a kilometer southeast of Meenakshi Temple, Tirumalai Nayak Palace is Madurai's second biggest attraction. King Thirumalai Nayak built it as his residential palace in 1636, with the input of an Italian architect. It's a classic fusion of Dravidian and Islamic styles. The palace's distinguishing feature is its pillars and there was once more than 200 of them. Sadly, only a quarter of the original structure is intact. This consists of the entrance hall, courtyard, dance hall, and audience hall. The palace was even used a district court during the rule of the British, and continued as such until 1970. Substantial money was recently spent on major restorative works. The entry fee is 50 rupees for foreigners, plus a 30 rupee camera fee. It's open from 9 a.m. to 5 p.m. daily, except between 1-2 p.m. when it closes for lunch. There's a sound and light show every evening. 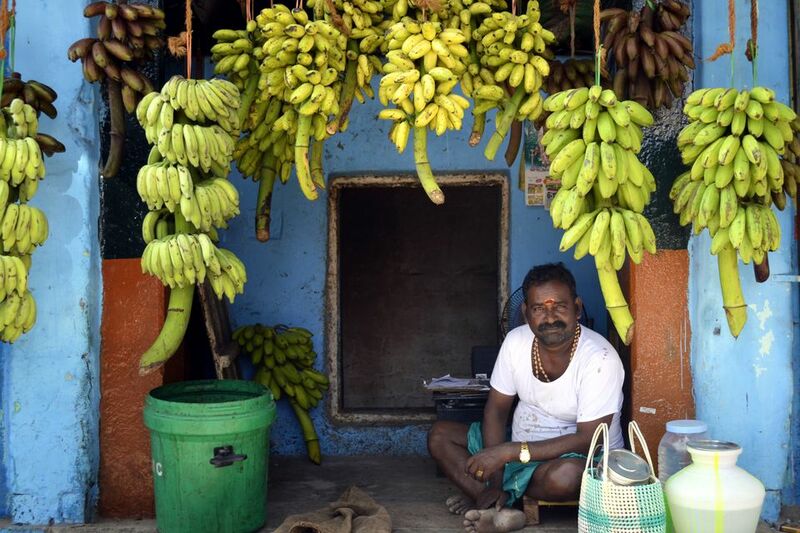 Madurai's wholesale banana market is a fascinating place to visit. Apparently, 16 varieties of bananas are sold there! They arrive, clustered together on branches, by the cart load. Watch as wiry workers unload them and carry them inside, up to half a dozen branches at a time. There's a vegetable market next to the banana market, which is also a hive of activity and great for people watching. If you want to taste the best south Indian food in town, the renowned Murugan Idli Shop on West Masi Street is the place! This restaurant is simple and unpretentious -- as they say on their website, they have a south Indian ambiance, which means loud and friendly. Their specialty isn't their decor but the "traditional mouth watering dishes from our grandmother's heart". Apart from idli and dosa, the highlight is their special blend of spicy chutney powder. It's ordered separately, along with oil to mix it with. If you're keen to explore local cuisine, Foodies Day Out in Madurai does the best food tours in the city! Across the dry Vaigai River, housed in the Tamukkum Summer Palace of Nayak queen Rani Mangammal, is one of the seven museums in India dedicated to Gandhi. It contains a number of items used by him including a shawl, spectacles, yarn, and the bloodstained dhoti (loincloth) that he was wearing when he was assassinated in Delhi in 1948. Gandhi took up wearing the dhoti in Madurai in 1921, as a sign of national pride. Admission to the Gandhi Memorial Museum is free, and it's open from 10 a.m. to 1 p.m. and 2 p.m. to 5.30 p.m. The Madurai Government Museum is also located in the same grounds. If you have time, head out to Thiruparankundram, around 20 minutes southwest of Madurai. There you'll find one of the city's other impressive ancient temples, dedicated to Hindu god Murugan (handsome son of Lord Shiva), who's revered as a favorite god of Tamils. At the top of Thiruparankundram hill, there's also a 14th century grave shrine of the Islamic saint Hazrat Sultan Sikandhar Badhusha. Time seems to have stood still there, and a single family has taken care of the shrine generation after generation. On the outskirts of Madurai, not far from Thiruparankundram, about 200 families in the interesting village of Vilachery craft small idols of Lord Ganesh for Ganesh Chaturthi and Bommai Kolu dolls for Navaratri out of clay. They also make nativity sets for Christmas. It's possible to take a walk through the village and see the artisans at work in their homes. Storytrails runs an insightful Potter's Trail tour to the village, where you'll get to uncover many stories and legends. Off-the-beaten-track north of Vilachery, Keelakuyilkudi village is also worth visiting for its collection of painted mud horses and Jain sculptures. The mud horses, located in the picturesque village temple, are donated by potters from Vilachery at the village festival every year. Behind the temple, climb the hundreds of steps up the rocky granite hill to the Jain caves. You'll be rewarded with ancient rock-cut sculptures of Jain deities, and a panoramic view over the countryside. Go early in the morning or late afternoon though, otherwise you'll get hot!